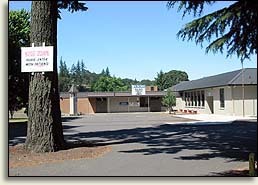 Opened in 1906 and rebuilt in 1949, North Albany Elementary School is proudly educating its fifth generation of Albany children. Located on a wooded 7.5-acre campus, the school serves students from the Thornton Lake area of North Albany. This program focuses on a different district character trait each month. In weekly announcements they are defined, teachers reinforce those monthly traits in class, and the principal reads a story which highlights the month’s trait each month in every class. Provides specialized PE instruction for students in grades K – 5. Provides specialized music and drama instruction for students in grades K – 5. Thanks to our volunteers, North Albany Elementary has an amazing art program. NAE students CREATE while learning and experiencing works from the great Masters of Art. For more information and to find out how you can be a part of this outstanding program, go to adventuresinartnae. This group of 5th graders volunteer throughout the school and community. This is with the goal of making a difference in the world. Small things matter! Provides the following service opportunities: FISH of Albany for grade 5. Teaches self-empowerment and conflict-resolution skills that are useful at school and home. Each spring, students accept the challenge of fitness walking or running during lunch recess. Fifth graders coordinate a waste reduction effort that involves every classroom. Provides motivational reading reinforcement and ongoing comprehension assessments for students in second through fifth grade. We believe that all children can and will learn. We will provide instruction, guidance, empathy, consistency and encouragement to empower students to be successful individuals and contributing members of society. The foundation which makes up the educational experience will promote academic, physical, emotional and social growth while preparing children for the life-long process of learning. The success of our programs requires the joint effort of students, teachers, parents, and other community members.